While Major League Baseball took a day off for the Home Run Derby, the minor leagues were in full force. All six affiliates were in action on Monday, and there were several transactions for you too. Tyler Jay made a start. Jaylin Davis had a day. LaMonte Wade reached base a lot. Tanner English had a big offensive day as well. On Tuesday, several affiliate have an off-day, allowing the players the night off to watch the game that they all likely have dreamed of playing in someday. Infielder Leonardo Reginnato was placed on the Rochester disabled list with a fracture in his left hand. Andy Wilkins was promoted from Chattanooga to Rochester. Also, Fernando Romero rejoined the Red Wings. Lewis Thorpe and Alex Kirilloff were removed from the temporary Inactive List of the Lookouts and Miracle, respectively. 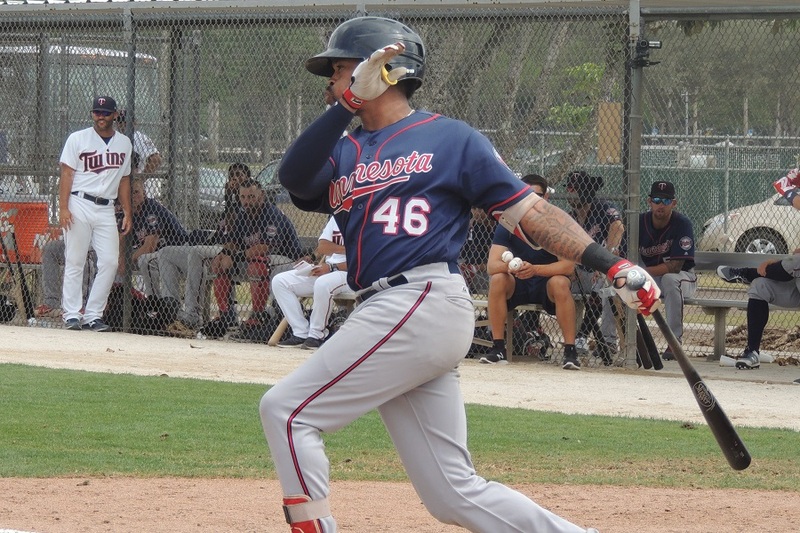 Infielder Yeltsin Encarnacion and RHP Tanner Howell have been promoted from the GCL Twins to the Elizabethton Twins. RHP Niklas Rimmel has moved from the E-Twins to the GCL. Finally, Miguel Sano was placed on the temporary inactive list. According to Twins farm director Jeremy Zoll, via Mike Berardino on Twitter, Sano has returned to the Dominican Republic due to a “family situation.” Obviously we wish Sano and his family the best. In addition, Darren “Doogie” Wolfson tweeted that the plan was for Trevor Larnach to get to Elizabethton on Monday and make his pro debut with the E-Twins on Wednesday. Zack Littell started and went just 4 1/3 innings. He was charged with five runs on five hits. He walked four and struck out five batters. Gabriel Moya recorded five outs, four of them on strikeouts. Trevor May struck out three over two scoreless innings. Nick Anderson gave up a solo homer in the ninth, but he struck out the other three batters he faced. LaMonte Wade went 3-for-4 with a walk and two RBIs. Taylor Motter went 2-for-4 with a walk, his fourth double and his second Red Wings homer. Kennys Vargas had two hits and a walk. Jordan Pacheco also had two hits. Andy Wilkins knocked a grand slam in his first game with the Red Wings. The 29-year-old Wilkins has big league time with the White Sox (2014) and the Brewers (2016). After completing just two innings on Sunday, these teams resumed the game on Monday. Sean Poppen had started on Sunday and threw two scoreless innings, striking out four. When play resumed Monday, lefty Dietrich Enns was on the mound. It didn’t go well. He was charged with eight earned runs on nine hits in 4 1/3 innings. He walked on and struck out one. Todd Van Steensel came on and was charged with three runs on three hits and a walk in 1 2/3 innings. William Ramirez struck out two in a scoreless inning. Jaylin Davis led the offense. He went 3-for-4 with two RBIs and stole his second base. Luis Arraez went 2-for-5 with his first double. Tanner English went 2-for-4 with his 11th double. Jordan Gore had two hits, including his first AA double. Zander Wiel also had two hits. The regularly-scheduled game was just a seven inning affair. Jaylin Davis had another 3-for-4 game. Tanner English hit his third home run, driving in three runs. Alex Perez had a hit, a walk and was hit by a pitch. Jimmy Kerrigan and Jordan Gore each had two walks. It was a bullpen game for the Lookouts. Tyler Jay started and threw two scoreless innings. He gave up one hit and struck out two batters. Ryan Eades gave up one run over the next two innings. He struck out four. Lefties Sam Clay and Ryne Harper combined for three shutout innings. Mark Contreras has been a pleasant surprise throughout the season, starting in Cedar Rapids and especially since moving up to Ft. Myers. On this night, he went 3-for-4 with his sixth home run and two RBIs. Travis Blankenhorn went 2-for-3 with a walk, his 17th double and three RBIs. Clark Beeker started and went 4 2/3 innings. He gave up four runs on seven hits and two walks. He struck out three. Ryan Mason came on and gave up just two hits over 3 1/3 scoreless innings. He struck out two. Hector Lujan worked a scoreless inning. Randy Dobnak doing Randy Dobnak things. When the Kernels need innings, Dobnak provides them. He improved to 7-2 with seven solid innings. He was charged with three runs on five hits. He walked two and struck out seven. Jared Finkel gave up a solo homer in the ninth innings, but he struck out three over the final two innings. Trey Cabbage was the subject of Steve Buhr’s article this week. The article talked about how well he’s been hitting on the road. Well, in this game, he went 3-for-5 with his 13th and 14th doubles. David Banuelos went 3-for-4 with his 12th double and three RBI. Jose Miranda, fresh off being named the Midwest League’s Player of the Week, went 3-for-4 with his 20th double. Ben Rodriguez went 2-for-4 with a walk and his ninth and tenth doubles. Jean Carlos Arias went 2-for-4 with his 11th double. He also stole his sixth base. Ariel Montesino added his first double since joining the Kernels recently. After scoring in double digits in five of their last six games, the E-Twins had it done against them. Pedro Garcia started and gave up six runs on five hits and four walks over 2 1/3 innings. He struck out three. Seth Pinkerton came on and went the next 2 1/3 innings. He gave up four runs (3 earned) on two hits and five walks. He struck out four. Juan Gamez then gave up just one run over the next 2 1/3 innings. He walked two and struck out two. Tanner Howell made his Appy League debut and gave up three runs on three hits and a walk in 2/3 of an inning. Derek Molina walked two but got the final out. Ryan Jeffers and Alex Robles each went 2-for-4 with a walk. Chris Williams also had two hits. Yunior Severino hit his third home run of the season. The Twins got a solid start from Prelander Berroa on Monday. The right-hander gave up two runs on five hits and two walks over the game’s first five innings. He struck out two. Petru Balan came on and gave up two runs on four hits and two walks over the next two innings. He struck out three. It was his seventh outing of the season, the first in which he gave up any runs. Dylan Stowell came on for the final two innings. He gave up five runs on seven hits. The Twins had six hits and four walks in the game. Agustin Marte went 2-for-4 with his first double of the season. Yeison Perez walked and hit his fifth double. #2 - Alex Kirilloff (Ft. Myers) - Did not play. #5 - Stephen Gonsalves (Rochester) - Did not pitch. #11 - Blayne Enlow (Cedar Rapids) - Did not pitch. All Wade does is hit. And steal some bases (not many, but some). And play defense. big fan. I mean, he is returning from Tommy John surgery, which is fairly major. Never know how that return will be... We may just have to wait until 2019 to see him return to form. 10 of his 12 earned runs at Rochester were in his first three games nearly two months ago.He hasn't allowed a run since returning from the DL last month. What I find most interesting is that he hasn't been pitching every day or two.More like every four or five days.Although only going a couple innings at a time, are they getting him into a routine so that he can be starting games by late August? Jeffers continues to put up borderline video game numbers at Elizabethton.He has to be moving up soon. Who is Wilkins? Is he just org filler? Another cool thing about Wade that bodes well for his future - he has had more walks than strikeouts every year in the minors, including 2018. Leads to some nice OPS numbers as well. If you imagine that he's one year younger than Wade (actually 6 months younger), then he's played the same levels as Wade at the same age as Wade, and his numbers have been only moderately inferior to Wade's....pretty much centered on inferior BB and K rates.But meanwhile, Davis is making progress with the K%, he swings the bat right-handed, and presumably has a good arm (based on the preponderance of his starts being in RF). This isn't a Davis/Wade comparison...Wade started out miles ahead of Davis and remains way ahead of him, obviously...but it's starting to seem like Davis might have a shot, which would be quire remarkable given his story and draft status. I think Davis was basically a toolsy lottery ticket that might pan out. Some of them do. Zack Littel did not pitch?